Marc BLEUSE was born on the 23rd February 1937 in Niort, France. He spent part of his childhood in Vendée with a maternal grandfather whose family roots lay in the history of the Chouan movement. He would remain strongly attached to the traditions of this region. His father, a scientist, originally from the north of France, had little time to devote to his son: first separated from his family by the war, he died at an early age in 1949. His mother was a very competent piano player who performed a great deal of chamber music with violinists such as Cecilio Goerner, Léon Ziguera and, much later, André le Métayer. This environment encouraged Marc Bleuse to develop musical affinities. He began to study the piano at the age of six - rather chaotically, given the events at that time. Settling in the region of Saint-Etienne, he received a general education from the Jesuit Fathers at the Collège Saint-Michel and began to study music seriously at the Lyon Conservatoire, under Marcel Paponaud for the organ and Charles Montaland for writing. At the age of 17, he organised a choir in a village where he was giving music lessons to help his family. This experience no doubt goes some way to explaining his career orientation. He introduced his singers to the polyphonic repertoire of the Renaissance and also harmonised popular songs to facilitate their recruitment. In November 1961, although he was supporting his family, he decided to enter the Cherchell reserve officers' school in Algeria. Until the declaration of independence, he waged a war that the authorities of the time euphemistically referred to as 'maintaining order'! On his return, he enrolled at the Conservatoire National Supérieur de Musique in Paris, where he entered Simone Plé's class for fugue and counterpoint, then André Jolivet's composition class two years later. During his higher studies, he was a musical education teacher for the City of Paris and held the post of organist and chapel master at Notre-Dame de Grâce in the 15th district of the capital. He also created a chamber orchestra with a few friends from the Conservatory and a choir of students. He conducted many concerts with these formations, as well as certain solo artists : Anne-Claude Villard, Simone Feyrabend, Thérèse Pollet and Odile Poisson - who would form the Quatuor Elyséen - Jean-Jacques Kantorov, Brigitte Tournus, Claude Maindive, Elisabeth Balma and a number of others. It was in 1967 that Marc Bleuse's music was published for the first time : Heugel included a piece for mixed choir, brass and kettle drums entitled Lauda Sion, Alleluia in their Plein Jeu collection. On several occasions, he used texts of liturgical or religious inspiration : Le chemin de croix from Paul Claudel's Breviaire poétique, first performed at the Festival of Religious Art in Paris in 1983 ; Alors le Paradis..., first performed by the Groupe Vocal de France at Saint-Louis en l'Ile in 1986 ; Femme, extract from the Cantique des Cantiques, first performed at the Comminges Festival in 1995. Following his studies in Paris, Marc Bleuse - having obtained the first Certificate of Aptitude for the post of director of state-controlled schools in 1969 - was appointed director of the National School of Music in Perpignan. During this period, he ensured widespread changes in the school he headed and organised an initiative for the performance of symphonic, lyrical and overture music from the contemporary repertoire. In 1972, he invited André Jolivet to conduct a concert of French music. In the programme, Jolivet included his own Symphonie de danses, Octandre by Edgar Varèse, Marc Bleuse's Cantate and Bizet's Symphony. In 1973, Marc Bleuse conducted a new production of Fidelio directed by Jean Deschamps and married Anne Fondeville, the young soprano who played the role of Marcelline. On the death of André Jolivet in 1974, he wrote Koïmeterion as a tribute to his master. The piece, first played by the Louis Auriacombe chamber orchestra, would subsequently be performed many times, both in France and abroad. In 1975, Marcel Landowski appointed Bleuse to the Inspectorate of Music after his name was suggested by Jacques Charpentier. He visited almost all the state-controlled music teaching establishments in France. This second Parisian period lasted until April 1990 and it was in his house in Boulogne-Billancourt, in the suburbs of Paris, that Marc Bleuse wrote most of his music. In 1980, he was appointed Inspector-General for musical education. From January 1984 to November 1986, he ran the Paris Conservatoire National Supérieur de Musique and concentrated on modernising the methods of this establishment, still redolent of the 19th century. His reforms notably targeted the singing, orchestra and composition classes. He introduced the compulsory practice of polyphonic song or plainsong for instrument players, which led to the creation of a Gregorian chant class; he extended higher studies to all of these subjects and encouraged the formation of string quartets. At the same time, Marc Bleuse directed musical operations for the public establishment of the Parc de la Villette. 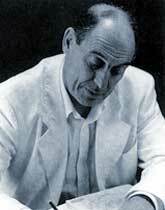 Along with Pierre Boulez, he became one of Christian de Portzamparc's main associates in the Cité de la Musique project. During this period - which was highly productive on a professional level - he was invited to the Soviet Union to conduct the Tchaïkovsky Conservatory Chamber Orchestra in Moscow, as well as the Minsk Philharmonic Orchestra. The Gérard Billaudot publishing house have published many of his instrumental and vocal pieces, and his Concerto pour violon et cordes, recorded by Tibor Varga and frequently played both in France and abroad, notably by Jean-Claude Bernède, Devy Erlih, Patrice Fontanarosa, Pierre Amoyal, Serguei Kravchenko and Alain Moglia. Apart from the daughter of his first marriage, Anne, he had three children with Anne Fondeville. All three would become professional musicians : Emmanuel (cello), Pierre (violin) and Jeanne (piano). From November 1986 to November 1988, Marc Bleuse replaced Maurice Fleuret at the rue Saint-Dominique. The memorable points of his action at the Department of Music and Dance were related to his policy in favour of string quartets. This notably benefited the Parisii, Manfred and Ysaÿe quartets (the latter are the dedicatees of his recently-published string quartet). Since 1990, Marc Bleuse has continued to work in Toulouse. In 1993, Michel Plasson - with Michel Strauss and the Orchestre National du Capitole de Toulouse - gave the first performance of his Concerto pour violoncelle, which was commissioned by Radio France. It is difficult to use the term "school" in relation to Marc Bleuse's music, whose treatment, it must be said, does suffer from a certain empiricism. However, like the man himself - who has always insisted on his individuality when confronted with the media-based intelligentsia - the music is atypical ; his writing, which gives priority to mode and timbre, is closer to a discourse than a language concept.